At Calvert Foundation we often speak of our objective to “democratize” social investment capital —that is, to provide underserved communities access to financial products and services, and to make it easier for individual investors to contribute to community development. In short, we aim to empower investors to empower communities. Through this lens, our Community Investment Note is not only an investment product, but a tool for engagement and awareness building. It allows people to connect with issues that they are passionate about by aligning their investment dollars with their values. Last year we introduced an opportunity for investors interested in women’s issues to contribute to women’s economic empowerment through our WIN-WIN Initiative and in prior years we offered investment options such as the Gulf Coast Recovery Note for Americans who wanted to help rebuild the delta after Hurricane Katrina. This week, we are excited to explore values-based investing with a new demographic: diaspora communities. 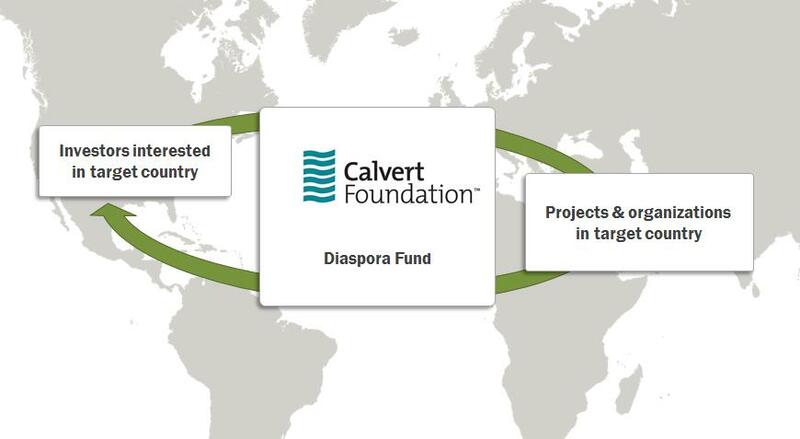 For the past year, Calvert Foundation has been exploring a Diaspora Initiative that, using our retail investment product (the Community Investment Note), will allow U.S. diaspora members to invest in the development of their countries of origin or heritage and U.S. regions where their diaspora community is concentrated. The W.K. Kellogg Foundation recently awarded Calvert Foundation a grant to conduct a feasibility study for the initiative, with the goal of launching a pilot for a specific diaspora community at the conclusion of the study. We are currently researching the potential for a diaspora initiative in three locations, focusing on countries with strong diaspora identities and large communities in the U.S.
Diaspora communities are a powerful engine for development with tremendous talent, energy, networks and resources. The statistics on global remittance flows, which are estimated to have reached over $534 billion in 2012*, are often used to illustrate their influence. But remittances, while crucial to helping developing nations grow, are transmitted directly to households rather than to shared community resources. A diaspora Community Investment Note could serve as a compliment to remittances, concentrating and leveraging the diaspora’s resources to address shared challenges and build civic infrastructure while generating a social and financial return. We are particularly excited for the Diaspora Initiative’s potential to diversify the impact investing community. In addition to engaging new retail investors, the initiative also will introduce new institutional partners such as foundations, NGOs, accredited investors and governments – an entire ecosystem of partners who are plugged into the Diasporas efforts – to impact investing. The key to a successful Diaspora Initiative will be partnership and collaboration. Calvert Foundation is looking forward to working with new partners and building off existing diaspora efforts. We view the Diaspora Initiative not only as an opportunity to increase the flow of capital to underserved communities around the world, but as a chance to create new pathways for civic engagement. We welcome all those who want to join us to engage diaspora communities for development. Please contact me at leigh.moran@calvertfoundation.org for more information. * Groves, Susanna. IdEA website: Remittances Hit $534 Billion in 2012, Setting New Record. Nov 26 2012. Leigh Moran is an officer on the Strategic Initiatives team at Calvert Foundation, focused on the design and implementation of investment initiatives based on key social impact areas.